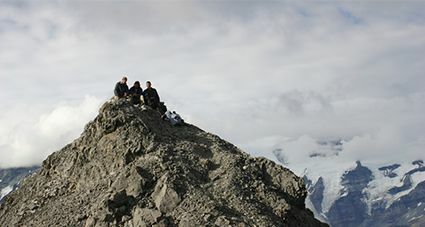 Our Alpine Scrambling Expedition combines Alaska hiking and mountaineering for backpackers who wish to incorporate some easy Alaskan summits into their adventure. The climbing is non-technical but still offers the opportunity to learn and practice basic climbing skills and techniques. Located in the high country of the Chugach Mountains, numerous summits offer a wide range of terrain types. Bush planes allow you and your guide to gain access to the area and then backpack into higher country using glaciers and moraines as “trails”. Rugged peaks in the six to seven-thousand foot range (1,828 – 2,133m), some of them still unclimbed, rim the nameless valleys that you’ll explore. On clear days, the possibility of awe inspiring views will awaken the climbing spirit in you as you scamper from peak to peak looking for new vistas of the mountains and tundra beyond. Previous backpacking experience and good physical conditioning are a must for this adventure.